Keeping up with the new trends each season, year after year, can be difficult and exhausting. Pouring through magazines and finding the outfits that the hottest celebrities are wearing can be very time-consuming. Scout and Molly’s Boutique of Deerfield Square has the hottest trends for each season to keep you looking and feeling great. These bike shorts are great for running and biking, but they are also setting the style world on fire this year. These shorts are great for athletes and are sure to make you look great while working out, but they can also fit any casual occasion. If you are looking to relax and hang out with some friends these shorts are a great option. They pair well with any stylish top and cute shoes and are sure to take your comfort to a whole new level as they show off your curves, highlight your legs, and keep you feeling and looking confident. Whether it’s a first date, a night out with friends, or a job interview, the Bailey 44 sleeveless top with Dl1961 ripped denim jeans are sure to make a great first impression. Our Deerfield Square boutique carries both of these items and other great accessories that you can pair with this item. The sleeveless top is tight to show off your curves but has ruffles on it to help you hid any unwanted attention. The ripped denim jeans are skinny jeans that will set you apart from others and are fitted to help accentuate your natural figure and keep you looking your best. This outfit is a top trending style setter this year because it is both casual and business casual. It can be paired with heels, boots, and even sandals to give you the impression you’re after. 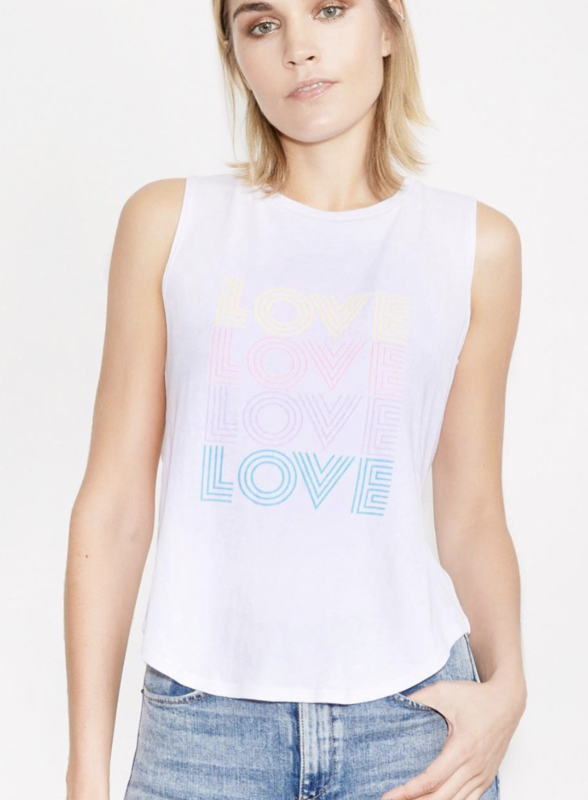 This Generation Love tank top is a must-have for all. It is stylish, yet comfortable and can be worn with shorts, jeans, and even skirts. It’s sure to help you feel and look your best. If you are going to the beach, walking around town, going to a sporting event, or just relaxing with your friends this shirt is a perfect option. The white background and colored letters will match anything in your closet while the loose fit and sleeveless arms bring attention to your arms and hid any extra weight you may be trying to lose before summer hits. This casual, yet stylish outfit keeps it simple. These looks are sure to help you become the new trendsetter in your city. Scout and Molly’s of Deerfield Square has the hottest clothes of the year to help you make a great first impression and to make you stand out in the crowd. Make 2019 the best year of your life by styling yourself with these new trends that are sure to keep you looking (and feeling) confident all season long!